Breakfast with the Joiners and builders. Yes while breakfast was being served landlord had to tell them to stop building work, as the dust was falling into our breakfast. We left and walked through the town found the famous White Horse pub (Nellie's) to the students. 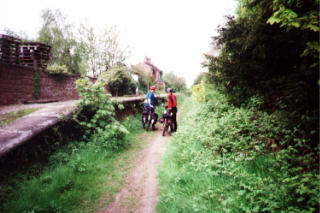 Then out of the town and onto the Hudson way a cycle path on an old railway track which took us out over the wolds north. You don't get better cycling than this. It was overcast but pleasant countryside. 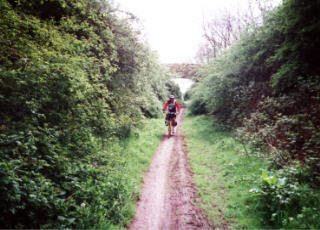 We slowly climbed all morning on the cycle way toward Market Weighton. As we neared market Weighton we decided to hit the road and struggled with our bikes up and over a fence. Only to discover a gap and a gate a few yards further on. Anyway it was a pleasant ride as we arrived in market Weighton. The sun was breaking through. In Market Weigh on we saw a fellow multi day man with full panniers. He asked us had we seen a cafe. I pointed one out. That looks a bit posh for me he said WHAT !!!! It was a right greasy spoon. Graeme and me went for a pint leaving Colin to enjoy the sun and the cyclist who was up and down the High Street. He eventually bought a bag of chips. Come to think of it so did Graeme . After a decent pint a bag of chips in the Sun and the stamping station. We had a long drag out of Market Weigh on up and up to the village of Landsborough. It was however to be the last climb of the ride. From the top it was a lovely ride down through the Wolds countryside to Pocklington. A toilet stop and apart from the pleasant town all you could smell was the kebab house. A flat ride through pretty countryside with the sun on our backs through the turf fields and into Stamford bridge. The village had the famous battle and Graeme showed great interest we even stopped on the famous bridge for a photo. We then followed the back lanes through excellent kept farm land to Dunnington. The outskirts of York a commuter village. Merton and to Osbaldwick a short detour for old times sake to visit Osbaldwick CC . Yes I did play at that level once. Many years ago. AH WELL. 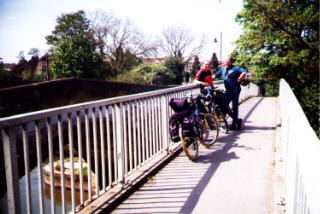 We cycled into York and through the traffic arriving in good time at the Digs 6pm. So we could shower change and I could show Graeme and Colin the tourist sites.. Yes The Culture trail ,we also had to take in a pint at the Roman bath. A walk on the walls and then the Ghost walk. Which was interesting and then we rounded the night of with a Chinese meal which was very good apart from MR Jobsworth who was organising tables. It was quiet amusing because all week after meeting the China man we had to have No 65 on the menu which turned out to be Mixed vegetables. Pleasant meal and then a steady walk back to the digs. Last day tomorrow.